New apartments slated for d-town across from West End Trading Co.
A vacant lot that was once the site of a hotel may soon be the site of a small mixed-use building. Located at 201 S. Sanford Ave., the site is at the southeast corner of Sanford Avenue and 2nd Street. Locals know the site as the dirt parking lot directly across from the West End Trading Co. The three-story development would include 14 one-bedroom apartments on the top two floors and 2,200 square feet of retail space on the ground floor. If built, the $3.5 million project would be the first new construction along that stretch of Sanford Avenue in 50 years. Dan Matthews, the developer behind the project, said he has watched the “buzz” about Sanford grow as new breweries, restaurants and entertainment have opened and brought new visitors to town. In particular, Matthews believes there is a market for his project among employees working at the large corporate campuses in Lake Mary like Verizon, AAA and Veritas, among others. “People want to live in a real downtown, not a cookie-cutter community,” Matthews said. 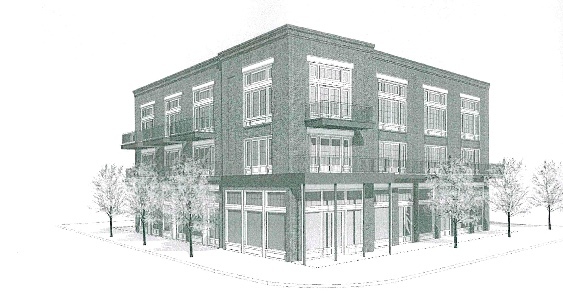 A rendering of what a 3-story project might look like at the southeast corner of 2nd Street and Sanford Avenue. Sanford’s Downtown Community Redevelopment Agency awarded Matthews a $50,000 construction grant. The grant was created last year as a way to spur development in the area. While the contribution is not substantial, the grant does give the CRA an opportunity to market development downtown. Matthews does not own the property, but has a contract to close on a purchase in December, after the Sanford Planning and Zoning Commission meeting on Dec. 7. While the property is zoned SC-3 commercial, Matthews is seeking a conditional use to reduce the amount of parking required on the roughly quarter-acre site. He is proposing 14 on-site parking spaces, or one for each one-bedroom apartment. Engineering for the project is being provided by the Orlando office of VHB. The project will be funded by a mix of private equity and bank financing. Matthews said he is currently negotiating with several banks, and has yet to select a general contractor for the project. The property was once the site of the Hotel San Leon, which survived the Great Sanford Fire of 1887. The hotel was eventually razed between 1912 and 1917, and the property has been vacant ever since. The land currently generates about $600 yearly in tax revenue to the CRA. If developed, it could add $25,000 annually to the CRA’s coffers. Show your friends you're in the know by sharing this story. Previous Previous post: What was that incredibly loud noise at the airport late last night?